Ayonna Blue Donald is committed to serving Cleveland both professionally and personally. She is the President of the Greater Cleveland Delta Foundation Life Development Center which is a nonprofit committed to empowering low-and-moderate income members of the Greater Cleveland community. 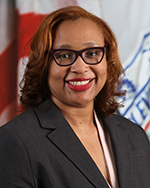 After graduating from law school, she worked as a litigation attorney in Texas and later as an appeals hearing officer with the Texas Workforce Commission, Ms. Donald returned to Cleveland in 2012 to work as a legal secretary with Building & Housing for Mayor Jackson’s Emergency Vacant Property Inspection Initiative. In 2013 she transitioned to a paralegal position and then to Demolition Compliance Officer in 2014. In these positions, Ms. Donald has handled legal matters related to inspections, environmental compliance, demolition compliance, and collections. Ms. Donald also is a certified trainee master plans examiner, and is familiar with Building & Housing’s permitting and plan examining processes. In September 2016, she became the Assistant Director of the Department of Building and Housing and on April 10, 2017 was sworn in as the Interim Director of Building and Housing. Ms. Donald received her Bachelor of Science degree in Mechanical Engineering from Case Western Reserve University and her Juris Doctor from the University of San Francisco School of Law. She is an attorney licensed in Texas and a registered patent attorney before the United States Patent and Trademark Office. Ms. Donald lives in Cleveland Heights with her children, Zach and Zoie.